Time for another barnstorming, no messing around, straight into the thick of it curry. This time, there’s coconut milk in the mix, which helps to considerably tame the enormous amount of chilli present. It does seem like a lot of chilli, but coconut milk has the capacity to neutralise the heat very effectively…this is still a hot curry, but it isn’t unbearable, and it does mellow further after a night in the fridge. Start by marinating a kilo of diced mutton or lamb in half a 400ml can of coconut milk watered down with the equivalent of a can full of water, so a one to two mix. Watering the coconut milk down is an important step, because the milk is going to be brought to the boiling point – it would split if added undiluted, and rescuing the dish in that situation would be next to impossible. Cover and refrigerate the meat. It needs to rest for at least two hours, but overnight would be better. The base of the curry is fairly standard, just a mix of onion, garlic, ginger and spices. Fry a chopped red onion in oil in a large pan until it starts to turn golden, then add a teaspoon of black mustard seeds. Let the seeds pop, then add four of five chopped green chillies – remove the seeds and pith if you want to temper the heat a little. Add a dessert spoon each of pureed garlic and ginger and a small handful of curry leaves, with a teaspoon of ground cumin, two teaspoons of ground coriander and one or two teaspoons of chilli powder, depending on how hot you like it. Finally, add two dessert spoons of garam masala and half a teaspoon of salt, stirring and frying until the masala is rich and darkening in colour. Next, add the meat, along with its marinade, bringing it all to the boil. Scrape the bottom of the pan with a wooden spoon to lift any stuck-on bits back into the curry. Top the liquid levels up with the other half of the can of coconut milk, similarly watered down. The curry just needs to sit on a low heat now, gently cooking away. From time to time, add some more watered down coconut milk as levels in the pan drop, until there’s two whole cans of coconut milk in play. It’s really not possible to give an accurate cooking time – that depends on the meat. Mutton can take over an hour to tenderise, sometimes more. Lamb will be quicker. It’s done when it’s ready. As the meat approaches tenderness, add 200g of peeled, diced potatoes, and let them cook through to the point where they’re done, but not disintegrating. Adjust the salt – it will probably need more. The coconut will reduce gradually, but increase the heat towards the end, before adding the potatoes to reduce it more quickly if that’s needed. The sauce will be rich and thick at the end. Serve with rice and any type of Indian bread. , a 2001 book by the late Keith Floyd that accompanied a Channel 5 series. Floyd was one of the first ‘celebrity chefs’, and pretty much tore up the script when it came to presenting cooking on the telly. He ditched the stuffiness and measured approach that was common in the seventies, favouring an easier and more informal style that involved throwing things into pans with cavalier flair, a glass of wine for the chef always close at hand. It doesn’t sound that unusual today, but in his day, Floyd was a revolutionary, and he changed the way food was presented on TV. I found a recipe book in a charity shop a while ago by Floyd. It had a fetching photo on the front of the author decked in a classy eighties ensemble with the most stupendous braces and the recipes themselves are so reminiscent of the idea of decadence of that decade to almost seem like a totally charming parody of it and (lots and lots of champagne cooked with everything, beef fillet and lobster cooked together, a hell of a lot of cream and a great fascination with the microwave). To be fair to it, I have attempted many of the combinations so I suppose there is only so much I can mock! I often wonder how people will look back at the decades that I learnt to love food in and say about the approach. 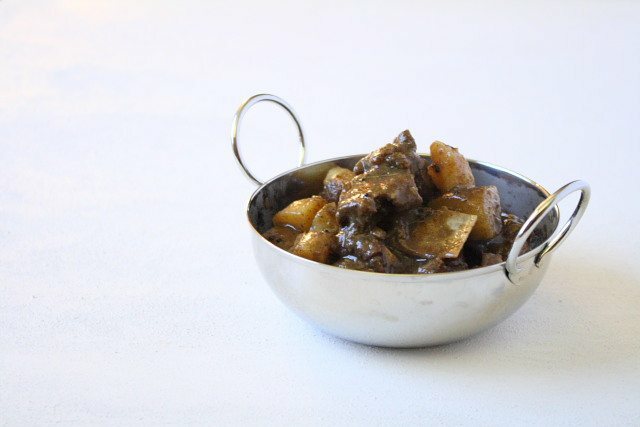 I like the few mutton recipes you’ve done – they’ve always been very dependable and assured in their flavour base and the tomato mutton curry you featured once has become much loved in this house by my chilli-wary partner! I hope you do more. That’s exactly what Floyd’s cooking was like in the eighties…very flamboyant, decadent, even. His later books are more straightforward. This Indian book is from 2001 and it’s relatively straightforward. this recipe, for example, is fairly well pared back…there’s nothing unnecessary there at all. I think that’s an interesting point about how people will look back at the food of the eighties. Who knows?